Liberal MSNBC host Rachel Maddow appeared on the Daily Show, Tuesday, to promote her new Timothy McVeigh special and to compare, "The dark side of it is that [McVeigh] really did see himself as part of an anti-government movement in the United States...And, right now, I think we are experiencing an upswing again in sort of anti-government extremism." Maddow didn't go into detail about who, exactly, is encouraging this upswing. Ads for her April 19 special, The McVeigh Tapes, have touted that it will put "into perspective the threat posed by anti-government extremism." In a commercial for the spot, Maddow lectured, "We ignore this, our own very recent history of anti-government violence and the dangers of domestic terrorism, at our peril." Of course, the Oklahoma City Bombing occurred in 1995 and nothing on that level has happened since from domestic terrorism. On the Daily Show, Maddow portrayed herself as a staunch defender of all kinds of speech: "Even in politics I really like bombastic rhetoric. I like people going over the top and using hyperbole and being a little nuts. I think it's exciting. I'm in cable, right?" However, it was Keith Olbermann, her MSNBC colleague, who previously trashed tea partiers for their "incitement to violence." RACHEL MADDOW: The dark side of it is that he really did see himself as part of an anti-government movement in the United States. And we have that to a greater or lesser degree over time in the U.S. And, right now, I think we are experiencing an upswing again in sort of anti-government extremism. And that's not to say that the next Timothy McVeigh is out there but it is to say that people should be not encouraging government violence against government institutions and people. JON STEWART: Encouraging the violence, that's always tough. But, I always get nervous, that's the same case that was made against rappers in the '90s. There was that sense of, like, "You put out a song and these rappers come out with these lyrics and they come out and kill cops." You always think, like, "Crazy people would hear that." I'm understanding that rhetoric is important. You can't legislate or even be to the lowest or craziest denominator. The thing I point to that makes me crazy is overpasses. A couple of idiots through a butter ball turkey off an overpass once in Ohio, I think, and now there's 15-foot fences no matter where you drive. And I always think, like, "Man, we can't have nice things, can we?" Because we have to legislate to the dumbest and the craziest amongst us. MADDOW: Well, but the First Amendment stops us from doing that. The First Amendment protects even the worst speech. It protects the most heinous things. And I actually- Even in politics I really like bombastic rhetoric. I like people going over the top and using hyperbole and being a little nuts. I think it's exciting. I'm in cable, right? STEWART: It's our food. It's our manna. MADDOW: It's what we live for. STEWART: Right. It's what we live for. 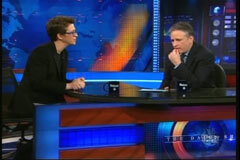 MADDOW: I also find it enjoyable. I think it's fun. I think it makes for a good healthy democratic discourse. Don't lie- or expect to get called out when you lie- and don't threaten to shoot people or encourage the shooting of people. Let's just agree to that.